For many, Ocarina of Time is the greatest video game ever made or, at the very least, one of the most influential. In this Kotaku feature story we speak to its creator, Shigeru Miyamoto, about the making of the game we waited seven years for. 1997. Mid-way through a year of strenuous development, Shigeru Miyamoto finds himself in a strange place; far from home, far from Nintendo HQ where his team is frantically connecting the final pieces of the puzzle that will become known to many as the greatest video game ever made. In the midst of that chaos Miyamoto returns — escapes — to Kanazawa, to make a speech in the place where he once underwent a more personal strenuous development period: his alma mater, his old university in Kanazawa, where he famously took five years to graduate from the art degree that would eventually help him win the job he’s held for the past three decades. Now, as a result of an unplanned stop in a convenience store, Miyamoto is face to face with a very confused store clerk. “Mr. Miyamoto, what are you doing? Why are you here?” he asks. Miyamoto looks up. The game? Oh. The game. 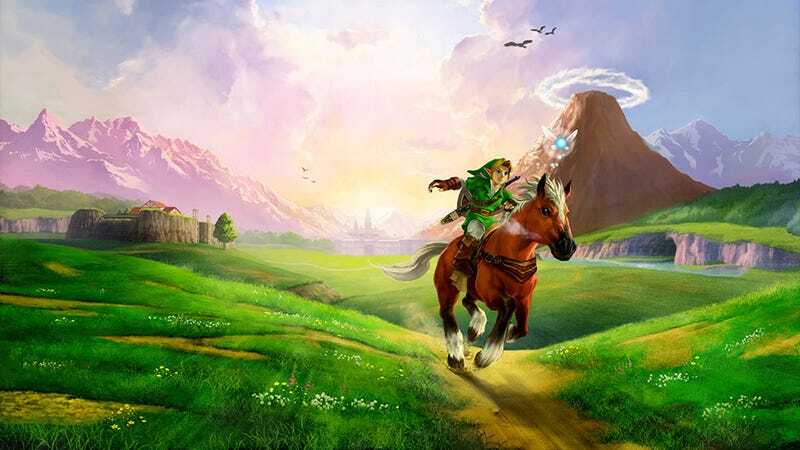 In an age of saturated viral marketing and artificial hashtagged hype, it’s almost impossible to overstate the legitimate level of anticipation gamers had for The Legend of Zelda: Ocarina of Time. Its predecessor A Link to the Past was arguably the most tightly designed video game ever made. In its wake Nintendo had released the Nintendo 64 and Mario 64. They had practically invented how video games functioned in a three dimensional space. Mario always represented the anarchic frivolity of systems firing on all cylinders, but Zelda was the closest thing Nintendo had to the video game as ‘experience’. Back then, the idea appealed. There was a shift in the zeitgeist: an entire generation had played Nintendo and subsequently ‘grown’ into the then successful PlayStation console. We were an army of teenagers in the clumsy process of becoming adults. We had played Final Fantasy VII, we were already plagued with a primitive nostalgia for A Link to the Past and we ached for that next step. A darker, more ‘mature’ Zelda that played out in three dimensions. A Zelda that was all we hoped it could be and more. But in 1995 Nintendo was in the midst of a very different transition: that grand dimensional leap into 3D, a transition that began, of course, with Mario. At Space World, when we had our first glimpse at the game that would eventually become Ocarina of Time, it was merely a tech demo. By that point Mario 64 was at least 50% complete; completely playable, utterly mindblowing. It would go on to completely redefine Nintendo’s approach to development. “Back then we didn’t really have a good idea of how strong the 3D visuals were, how strong they would be and what experience they would give,” says Miyamoto. Mario 64 was an epoch-defining video game, but it also served as prologue. Lessons learned during Mario 64’s development process were already being applied to Ocarina of Time in pre-production. Yoshioka Koizumi, one of the game’s many directors, remembers scribbling down ideas for Zelda in a notebook whilstdeveloping Mario 64. It made sense: Miyamoto and his team had no other template. No other template existed. “At that time there really was no blueprint for how to create that kind of game in a 3D space,” he explains. “No-one had done it before. 1977. Shigeru Miyamoto secures an interview with a company flirting with the idea of creating its own video game hardware. Among the many toy ideas he brings as examples of his work is a three-way see-saw. Miyamoto was always interested in bringing hidden layers of complexity to simple concepts. 20 years later he will attempt the precise same trick with Ocarina of Time. Today Miyamoto’s role at Nintendo requires a bird’s eye perspective, but he confesses his true passion lies in the details. Back then, in the mid 90s, Miyamoto played a broad role in overseeing development, but was heavily involved in the minutiae of Ocarina’s early experimentation. It was, he admits, a lot of fun. The nature of Miyamoto’s work involved completely reinventing one of Nintendo’s most important franchises. You’d expect that kind of pressure to be overwhelming, perhaps stifling, but Miyamoto and his team were completely divorced from expectations, creating an environment where no idea was off limits. An example: Miyamoto initially wanted Zelda to be played in the first person perspective, an idea that seems bewildering in hindsight, but outlandish ideas like those were part of the process. “There were lots of challenges in trying to show the game from a third person perspective,” explains Miyamoto. “We had also experimented with moments where the battles were in 3D but parts of the game were on rails. Intertwined in this experimentation was the slow process of prodding at the hardware itself. Many of Ocarina’s early prototypes were the end results of Miyamoto and his team getting to grips with technical limitations; with what the Nintendo 64 was actually capable of. Shigeru Miyamoto grew up obsessed with the Wild West. As a child he’d take aluminium cups from water fountains and batter them against concrete in a clip-clop rhythm. To Miyamoto, and an entire generation of Japanese children, it sounded like a horse galloping across the open plains. Epona was named for the Gallo-Roman protector of horses, but adding her to Ocarina of Time wasn’t Miyamoto’s idea. Initially, Epona was the work of Director Yoshioka Koizumi. The impact was immediate and sizable. “The horse was a turning point,” says Miyamoto. Epona wasn’t the solution to the sheer size of Ocarina’s playable space — Hyrule’s ponderous field was built in her wake. The horse came before the course and it heralded a major developmental shift. In familiar terms Epona was the item Miyamoto’s team held aloft with a triumphant chime. In the parallel puzzle that was Ocarina of Time’s development, Epona was the Master Key. Everything clicked seamlessly into place. There would be no more on rail sections. Ideas built during the castle phase of iteration would eventually be filtered into other areas of the game. Hyrule’s majestic field, where players could watch the sun set and then rise again, would now be the the grand centrepiece of Ocarina of Time. We would fight duels with skeletons; pierce arrows through the dead hearts of ghosts on horseback. We would encounter strange men running marathons across the plains and it would all be utterly, utterly unforgettable. Ocarina of Time is the story of a child who becomes an adult; it’s a theme with strange parallels and an intense resonance. An entire generation had waited patiently. We were children when we first played A Link to the Past; when Ocarina of Time was finally released in 1998 we were adults. A seven year gap between games. Seven long years. It felt like providence. A third of the way through Ocarina of Time, in a distant room in the sacred realm, Link’s spirit is sealed for the precise same amount of time. It was a quest Link couldn’t undertake as a child. Neither, perhaps, could we. But the connection was accidental, pure coincidence. As someone who preferred the depth of simple ideas, the concept appealed to Miyamoto’s sensibilities. There was a dramatic irony to Ocarina of Time, but it was subtle: one protagonist, two very different time periods. In the beginning we see Hyrule through the eyes of a child; but then we grow up. The world is a very different place. Something is lost and the universe we now inhabit is a persistent, cruel reminder of that. “I wanted to make sure we had something that felt a little bit simpler in terms of the differences between the world that Link experiences as a child, and the world he experiences as an adult,” says Miyamoto. “For example you would see how his relationship to the girls in the game would change from when he was a boy and he was an adult. When you were a child certain characters might have been scary. Or the adults who seemed stupid, how did you see them when you were a child? Miyamoto recalls the story of the boy in the convenience store; how badly he wanted Miyamoto to return to Kyoto. “Knowing that even the clerks in convenience stores were waiting for me to finish Zelda? That made me very happy,” he says, chuckling. In its final year, Ocarina’s development had a strange momentum; a frantic sense of desperate joy. Horizons broadened with each new day. Ideas exploded at a formidable rate as the development team edged closer to completing what would ultimately become one of the greatest creative endeavours in video game history. There were issues with some of the more systemic facets of Ocarina’s design — Miyamoto calls them “random elements” and uses the example of the game’s Postman. “We had to ensure those random events happened at points where it didn’t cause inconsistencies in the game,” he says. Then there was the moment when Miyamoto suddenly decided there weren’t enough Ocarina songs in the game. As development raced to its conclusion, it was the closest Miyamoto would come to “upending the tea table”. At this late point the team was in the process of obsessively play-testing Ocarina Of Time’s numerous ‘dungeons’; fine tuning layouts and inserting more fiendish puzzles. Everyone become so adept at zipping through dungeons that they failed to notice when the infamously difficult Water Temple began to stretch the limits of fairness. “It remains a regret for Eiji Aonuma to this day,” says Miyamoto, “mainly because he continually hears from everyone about how difficult the dungeon was! And then Ocarina of Time was finished. “I was just glad we could put it out there for people to play,” says Miyamoto. After seven long years, we finally got to play the video game we had waited so patiently for. We’d wake up in a forest; a child amongst children. We’d walk into a field and watch the sun set for the first time. We’d fight skeletons in our nightmares and hurtle across open fields in our dreams. The endless clip clop of aluminium cups on concrete would echo in our subconscious and then we’d awaken; ready to confront the once terrifying burdens of adulthood. Shigeru Miyamoto has a son. By the time Ocarina of Time was finished he was in the upper grades of elementary School. But Miyamoto’s daughter was younger; she was in the middle grades when the game was finally released. In Ocarina’s final scene Link is sent back in time to relive the seven years he sacrificed to save Hyrule. He places the Master Sword back in its sheath and returns to Kokiri Forest; a village frozen in an eternal childhood. Ocarina of Time will always be a story about a boy who became a man, but it’s also about preserving something. In the final frame Link returns to Hyrule Castle as a child; a mirror image of an earlier scene where he meets Zelda for the very first time. She turns and gasps in surprise. Or is it recognition? It’s almost impossible to say.